I use this blog sometimes as a bulletin board so I can look back in time over events. 1. Extend the above chart for the next 5 years. What do you think it is going to look like? 2. Give this some thought. 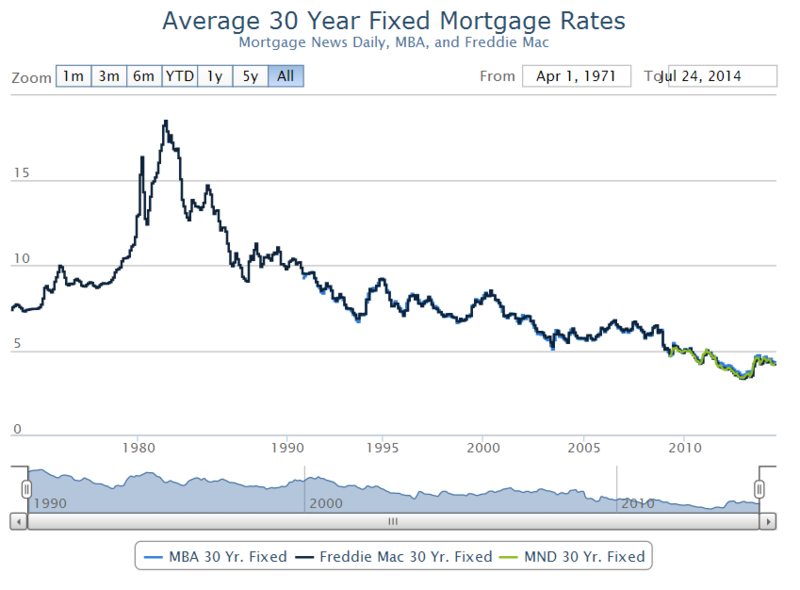 Do you think real estate prices should be inversely proportional to the decline in mortgage rates? 3. Use your own real estate purchase as an example. Mark the date of purchase and plot its price movements over the above chart. If you think falling mortgage rates should stimulate prices, is that true in your case? In conclusion, does Fed policy really have anything to do with the real estate market? I believe Fed policies have been misguided for far too long, artificially propping up prices that should be much lower. 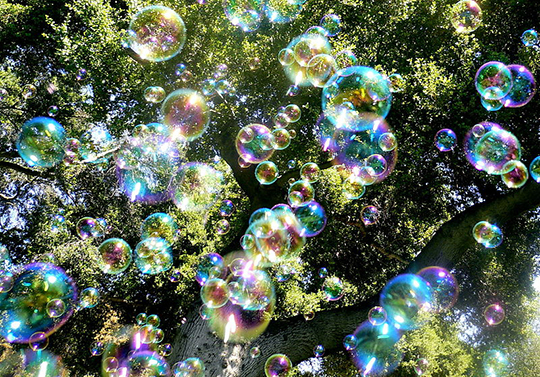 If one wants to identify bubbles, one must perforce study monetary conditions. The comparison of historical data on valuations and other ancillary factors can only take one so far. The problem is that in times of strongly inflationary policy, the economy’s price structure becomes thoroughly distorted, and that therefore a great many “data” can no longer be regarded as reliable. An added complication is that we e.g. cannot know in advance if the effects of the inflationary policy on prices will broaden out or not. Should “inflation expectations” (expectations regarding future CPI rates of change) rise markedly in the future, this would have a major impact on valuations, which would then begin to contract rather than continue to expand. If the case for U.S. stocks is built on global growth and lower interest rates, other factors, too, suggest that the market is heading higher. For one, Washington is determined to avert a financial disaster, particularly in an election year…. Bull markets rarely end when the earnings yield on stocks — now around 6% — is higher than benchmark bond yields. While some fear this year’s peak profit margins will wane, __________ says “margins will prove sticky at a high level” after years of cost-cutting. A 35% decline in leverage in the past five to seven years has made for healthier balance sheets, and continued stock buybacks are likely to keep boosting earnings per share. 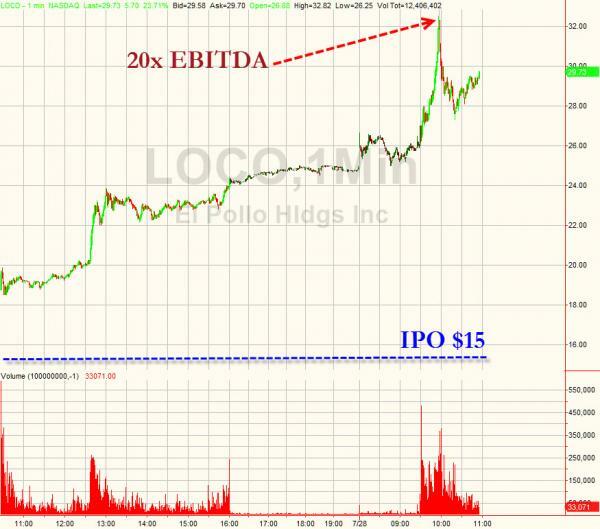 “While the first half may look like death, second-half earnings will improve…. I think most investors have the wrong idea about what it means to be bullish or bearish about an asset class such as stocks. Being bullish or bearish is not an all or none decision. Believing that the US stock market is richly priced does not mean that all US stocks are richly priced. It just means that the market, taken as a whole, is priced at a level that involves an above average level of risk. That risk, as last year so amply demonstrated, may not be realized in the short run or even what some might consider the long run. But the risk still exists and investors should take it into account when allocating their assets. Peter Bernstein, one of the greatest investors who ever lived, once said: Survival is the only road to riches. What that means to me is that, in a world where the future is unpredictable (that would be the one we live in), one must take into account the worst case scenario as an investor. What you shouldn’t do, as the quotes above prove, is take conditions as they exist today and assume they will continue into the future. Profit margins are always high when the economy is expanding and they always fall in a recession. You may not know when a recession will come but you know it will. Survival investing dictates that you take into account what happens to margins in a recession. Stock buybacks – at least since tax reform made them preferable – are always high when things are good and always disappear when the market needs them most. You don’t have to know exactly how things will change just that they will. In any scenario with multiple potential outcomes you have to at least consider all the alternatives. No matter what you expect, you have to assign some probability to the opposite outcome. If you believe the economy will accelerate in the second half of the year, what are the consequences of being wrong? In a highly priced market, being wrong about future growth could prove quite costly. It is the consequences of being wrong that reveal your true risk level. Epstein doesn’t seem to understand that the U.S. government doesn’t need to borrow what it creates. The U.S. government creates dollars. The U.S. government doesn’t need to borrow them to spend them. This seems so simple to me it’s hard to believe anyone would believe otherwise. Hopefully, you can accept a simple explanation. It’s true there are constraints. For example, there’s the debt ceiling. But this is a self-imposed restriction. There is no reason why the U.S. should have a fiscal crisis of any sort. Such a crisis could only be self-imposed. 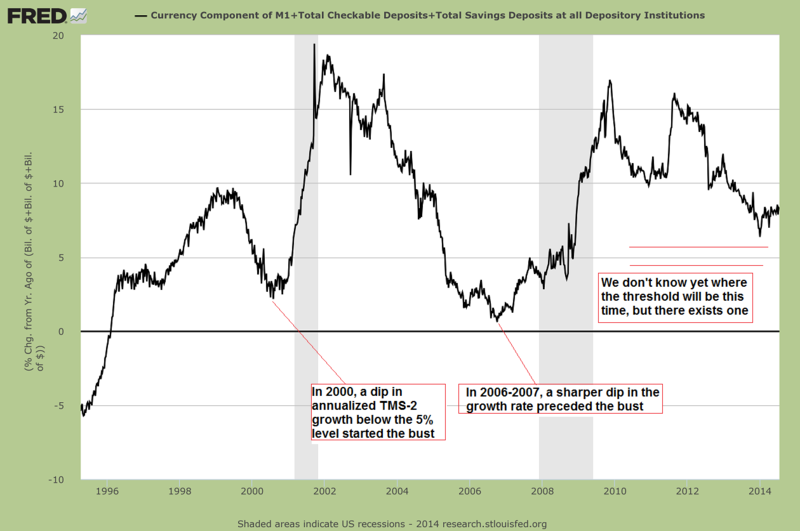 So the real risk is that policymakers don’t understand how their own fiat currency works. The real risk is that they listen to the CBO. .. If you don’t get the realities, then you invest foolishly. If you believe Epstein is right, then you’ll likely miss out on all kinds of great investment ideas because you’ll be afraid of a looming debt crisis. Instead, you’ll put your money in junky gold stocks — as if that will protect you! Locals and foreigners alike pay US dollars for goods and services across Panama just as you would in Houston, Jacksonville, or Las Vegas. This means that the country is subject to all the whims and consequences of US monetary policy; when the Fed conjures money out of thin air, the negative effects are quickly exported to Panama. Yet while it suffers all of the downside of quantitative easing, Panama enjoys very little of the upside. Of the jobs that the Fed claims they have created by printing $3.7 trillion over the last few years, zero of those have ended up in Panama. Not to mention, the Panamanian government doesn’t have an endless supply of foreigners lining up to buy its debt. So to get a true sense of US dollar inflation… and where it’s headed in the Land of the Free… one only need look at dollarized countries like Panama. 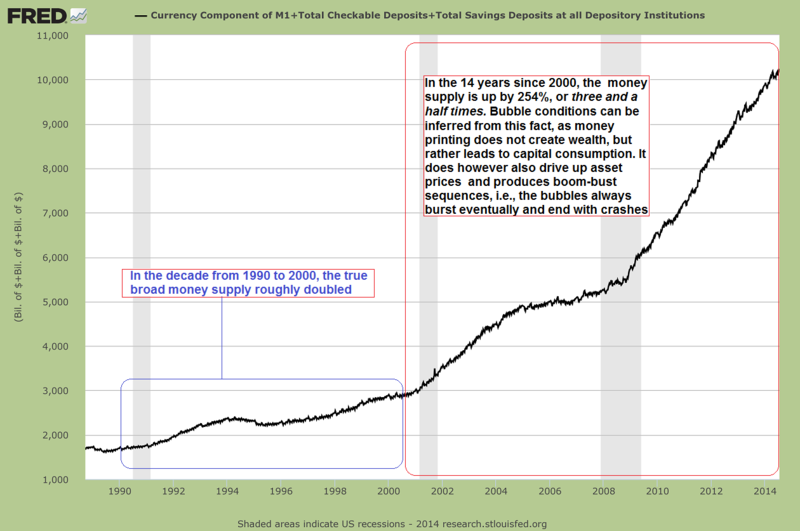 This entry was posted in Economics & Politics and tagged Acting Man, Bubbles, MMT, Real Estate. Bookmark the permalink.